I am slightly — ever so slightly — obsessed with David’s Tea. Yes, I may have tried 47 different David’s Tea flavors … but guys, that is maybe a third of all their flavors, so it is not even that much. And I may have about 40 different flavors o David’s tea in my room right now, in their own special tea basket on top of my dresser. And I may have once gone to David’s Tea three times in one day. But that was the first day I ever heard of it! If you are reading this article right now and thinking, hmm, what is David’s Tea?, then stop EVERYTHING you are doing, and bike to Palo Alto right now. For all you neophytes out there, David’s Tea is simply the best tea shop in the entire world. It has locations across the US and Canada, including one in Palo Alto. David’s Tea offers a myriad of choices — currently 162 flavors, according to their website. If you are thinking, nah, I’m really more of a coffee person, then you have not perceived the uniqueness of David’s Tea. 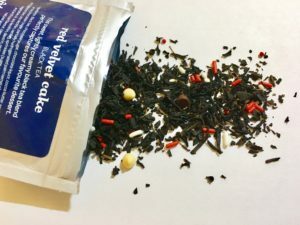 Because their tea flavors are not just your plain old earl grey and English breakfast (though they do have their own clever versions of those flavors) but exotic flavors like mint chocolate chip rooibos and cotton candy. It is actually incredibly overwhelming, walking in and being greeted by such a wealth of possibilities. So, given my immense expertise in trying all the David’s Tea flavors, I thought I’d rank all the teas I’ve tried. Cardamom French Toast: Best French toast I’ve ever had. I’m not kidding. I like French toast in tea form better than in the flesh (or in the bread?). It tastes like Christmas and fall, and the earthy taste of cardamom is balanced by the hint of sweetness of the tea. Delicious with almond milk. Coffee Cake: YUMMMM, so rich and deep and full of flavor — a hint of coffee, delicious with almond milk, does not need any sugar. Cotton Candy: Airy and tastes like the cotton candy of childhood. Not sickly sweet (just do not let it steep for too long). Forever Nut: Turns a pretty pink when seeped and has a rich, not too sweet flavor. Birthday Cake: The sprinkles are adorable, as are the tiny bits of cake included in the tea leaves. Red Velvet Cake: It has real pieces of dark and white chocolate! Pink Lemonade: HOW DID THEY MAKE TEA TASTE LIKE LEMONADE?? HOW????? THESE PEOPLE ARE MAGICAL. Mint Chocolate Chip: It tastes like mint chocolate chip ice cream when chilled with milk. Seriously. Like drinking a milkshake, except with 1/10 of the calories. Caramel Corn: Actual pieces of popcorn in it. And caramel. Genius. Vanilla Matcha: Yep, David’s Tea hopped on that trendy matcha train. Spiced Pumpkin: If you are trying to cut back on that PSL habit because you have overdosed on caffeine, try this herbal infusion. Alpine Punch: It makes me feel like I am sitting by the fire at a ski lodge, watching snow fall out the window. Pretty Good, as long as you don’t let it steep for too long: Some of their teas get to be cloyingly sweet if you leave the tea bag in longer than a minute. Carrot Cake: Addicting. All it is missing is the cream cheese frosting. Banana Bread: Sweet, banana taste. Maple Sugar: It tastes like fall. And pancakes and cinnamon and maple syrup. Cinnamon Chai: So you can make your own chai lattes in your dorm when you are tired of Coupa’s version. Unique Flavored Teas: Not sweet, very herbal or spicy. The Skinny: A magical tea alternative to going to the gym? Well, no, but it is a nice detox for your liver. Throat Rescue: To fight that freshman flu. Pick Me Up: More cold-killing medicine in tea form. Pumpkin Chai: Such high hopes — the cute little pumpkin sprinkles, the fact that it’s chai flavored — and it just tastes bitter and not at all like pumpkin … or chai. Chocolate Covered Banana: Sickly sweet and major weird aftertaste. Chocolate Covered Macarons: Ditto on the weird aftertaste. Mocha Latte: Apparently, not even David’s Tea can turn coffee into tea form. Witch’s Brew: Another Halloween flavor, weird green color and sickly sweet. And that is just half of the teas I have tried. Contact Caroline Dunn at cwdunn98 ‘at’ stanford.edu.